Every time I check out the New York Rangers on the NHL highlights of the night, the name Kevin Hayes always seems to stand out. Perhaps this is because he entered the Christmas break with 13 points in his last seven games. Unfortunately for the 26-year-old forward from Dorchester, Massachusetts, he’s red hot just when the league is shutting down for a few days over the holidays. Hopefully he won’t lose the momentum he’s built up once the puck drops again. Hayes has been a consistent contributor to the game-summary sheet this season as he’s helped the cause with 10 goals and 20 assists in the Rangers’ first 35 outings and is a plus-10. These aren’t superstar numbers but let’s face it, Hayes isn’t a superstar. He’s a solid player though and on pace to register a 25-goal and 70-point campaign. He scored 25 times last season and added 19 assists for 44 points and has also had seasons of 36, 45 and 49 points in the Big Apple while being a plus player every year. Originally drafted by the Chicago Blackhawks in 2010 with the 24th-overall pick, Hayes never suited up for the team though. He spent 2010 to 2014 fine-tuning his game with Boston College and scored 44 goals and 132 points in 142 contests. This included 27 goals and 65 points in 40 games in his last year at school while playing on a line with Johnny Gaudreau, the current star of the Calgary Flames. Hayes was rewarded for that season’s performance by being named to the NCAA’s and Hockey East First All-Star Teams and was also a Hobey Baker Award finalist. Hayes never did sign a contract with the Blackhawks however and he ended up inking a deal as an unrestricted free agent with the Rangers in the summer of 2014. The Rangers liked his versatility since he can play all three forward positions and also took a shine to his physical stature as he’s 6-feet-5-inches tall and weighs about 220 lbs. He scored 17 goals and 45 points as a rookie and placed seventh in Calder Trophy balloting, but dipped slightly the next season with 36 points. The Rangers still liked what he brought to the team though and signed him for another two years at a total of $5.2 million. He was then inked for another year in July 2018 as a restricted free agent. Heading into the holiday break, Hayes had come up with 83 goals and 203 points for the Blueshirts in 344 games. He’s also appeared in 34 playoff outings, but found the going a little tougher with just two goals and eight assists with a minus-four ranking. If you’ve been following along, we realize Hayes’ current contract is going to expire at the end of 2018/19 and the Rangers’ brass will need to decide what to do with him. He’s definitely too valuable to lose for nothing to free agency, so he either needs to be re-signed or dealt before the trade deadline. From what I’ve seen of Hayes, and due to his production, the sensible solution seems to be to offer him another deal. Even if the club does plan on a rebuild and/or youth movement it’s still going to require some veteran leadership and at the age of 26 Hayes fits the bill perfectly. If the Rangers do plan on re-signing the big forward they may want to do it now though since with each additional point he scores the price may go up. It’s no secret that he’s looking for a long-term deal and he’s still improving each year, but the longer the team waits the more he may cost. It’s true the Rangers have some good young prospects at center in Filip Chytil, Lias Andersson and Brett Howden while Mika Zibanejad anchors the top line, but Hayes or Chytil could easily be moved to one of the wings if needed. In fact, Chytil has already been reassigned to the flank. It doesn’t make much sense trading Hayes at this point of the season since the Rangers aren’t out of the playoff hunt. Granted, they’re not in the best position, but are still in the race. Of course, if they do fall by the wayside then Hayes becomes a valuable commodity to those teams which will be taking part in postseason activities. 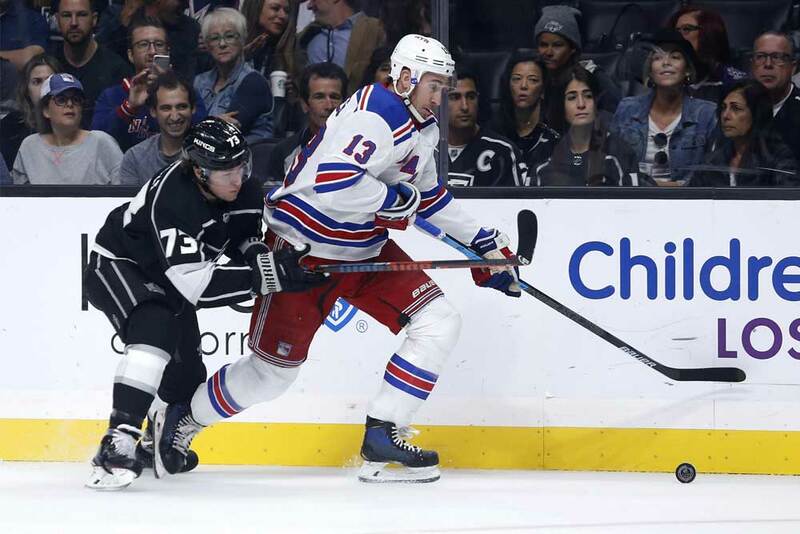 Depending on the return in a trade, the Rangers may be tempted to deal Hayes as a rental player to a top contender. The team also needs to take the next expansion draft into consideration since they need to leave players unprotected when Seattle gets ready to enter the NHL. If Hayes is signed it may mean one of the squad’s young prospects may be exposed. Rangers’ general manager Jeff Gorton will ultimately have to decide what happens with Hayes and he’ll need to figure out exactly how much he could pay him and remain under the salary cap. Hayes is already an established player while prospects have yet to prove themselves at the NHL level. For this reason and others it’s a good idea to keep Hayes at Madison Square Garden. There are many fans who feel the club should re-sign Hayes and build around him if necessary. In fact, quite a lot of them believe he should be named the side’s captain due to his leadership qualities on and off the ice. As of now, nobody wears the C for the team and hasn’t since blue liner Ryan McDonagh was traded to the Tampa Bay Lightning. It doesn’t make much sense to trade a proven 26-year-old player for a draft choice and then hope that youngster eventually develops into another Hayes. This approach seems like going around in circles and it’ll mean the club will be starting at square one again and waiting a few years for prospects to develop. Rangers’ head coach David Quinn uses Hayes as a penalty killer and on the power-play and he’s replied with two goals on each special team so it’s obvious he depends on and trusts him. If Gorton feels the same way about the player then the odds are good that Hayes will remain a member of the team for several more seasons…and deservedly so.